Free cash flow (FCF) reflects the amount of cash free for distribution to all stakeholders. The level of FCF does not always reflect the health of a business or its prospects. For example, a large amount of FCF can be a sign that a company has limited investment opportunities and, hence, limited growth prospects. On the other hand, negative FCF can be an attractive indication that a company has more investment opportunities than it can fund with internal cash flows. Zero FCF could mean that the company generates just enough cash to internally fund its growth opportunities. There are many ways to calculate free cash flow. Most approaches are short cuts to our more comprehensive approach to the calculation. The formula for FCF can be seen in Figure 1. 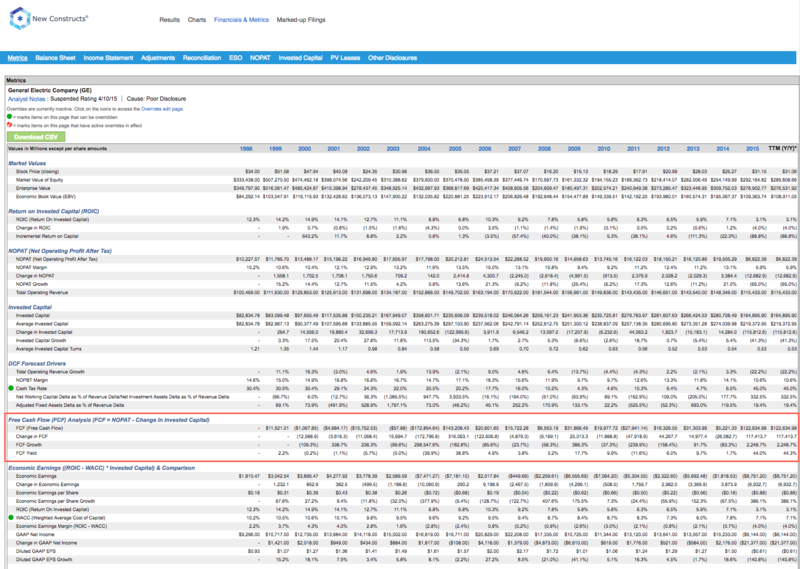 Free cash flow to equity holders/adjusted enterprise value. We’ve highlighted companies that misrepresent their free cash flow in order to trick investors into believing they are more profitable than they truly are. As we note in our article on ROIC, the FCF calculation is not hard. Getting all the data to ensure the calculation is performed with high integrity numbers is the hard part. We put extraordinary effort into ensuring we use the best possible NOPAT and Invested Capital for FCF calculations. Free cash flow yield (free cash flow/enterprise value) is a nice ratio to understand profits relative to the value of the business. In our opinion, it is far superior to dividend yield in reflecting cash flows relative to value. Figure 2 contains the companies with the highest and lowest level of FCF and their FCF yields. Per Figure 2, General Electric has the most free cash flow out of all companies under coverage. 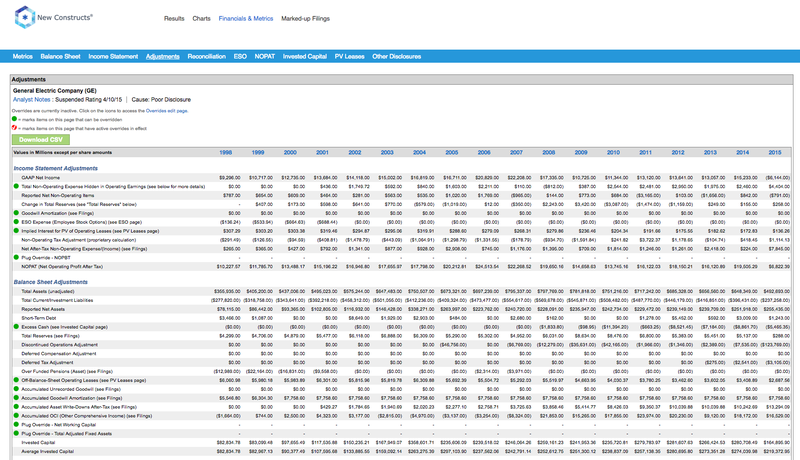 See General Electric’s historical free cash flow, dating back to 1998, in our model here. You can see that in nine of the past 10 years, General Electric has generated positive free cash flow, totaling to a cumulative $385 billion. Despite the impressive FCF generation, GE earns an Unattractive rating, largely due to its valuation. At its current price, General Electric has a price to economic book value (PEBV) ratio of 2.7. This ratio means the market expects GE’s NOPAT to grow by 270% from current levels. 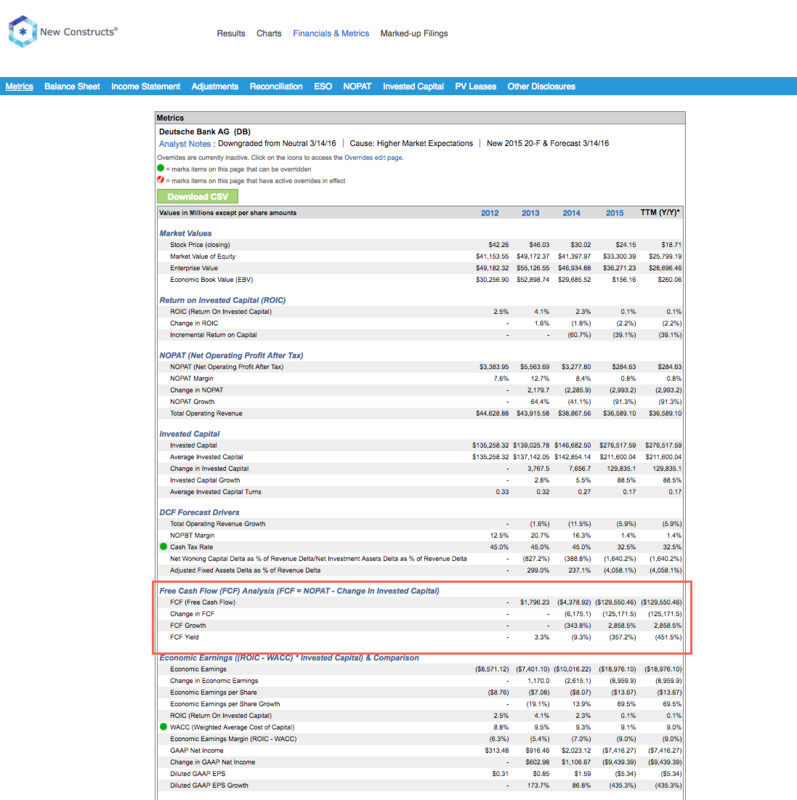 The adjustments page in our model shows all the adjustments we make to get NOPAT and Invested Capital right for GE’s FCF calculation. Apple Inc. (AAPL), Royal Dutch Shell (RDS.A), Nippon Telegraph and Telephone (NTT), and Citigroup (C) round out the list of companies that generate the most FCF. Additionally, these companies earn a high free cash flow yield. Deutsche Bank (DB) generates the least, or most negative, free cash flow of all companies under coverage. You can see DB’s free cash flow dating back to 2012 here. In Deutsche Bank’s case, the company has generated negative FCF for the past two years. 2015 was affected by a large increase in long-term liabilities, which greatly increased DB’s invested capital, but failed to increase profits. 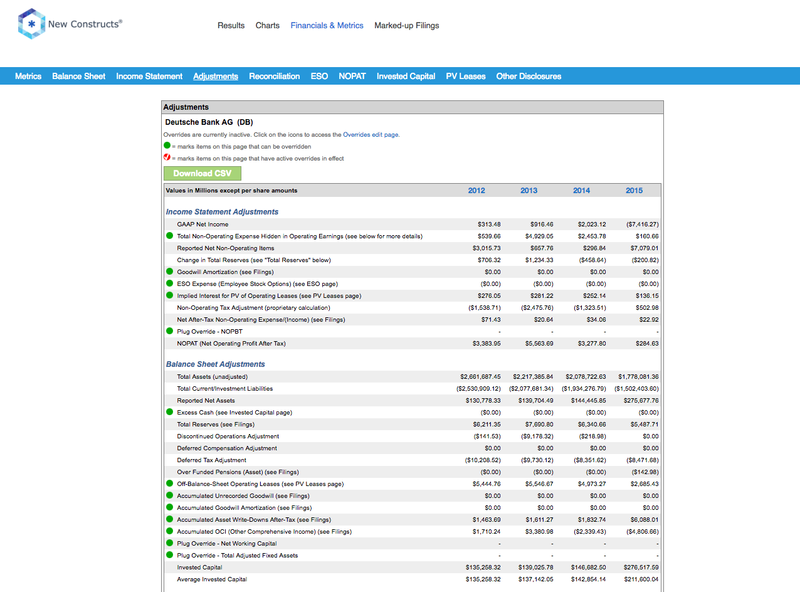 The adjustments page in our model shows all the adjustments we make to get NOPAT and Invested Capital right for DB’s FCF calculation. Petroleo Brasileiro (PBR), Medtronic (MDT), Allergan (AGN) and AT&T (T) round out the list of companies generating the least free cash flow. 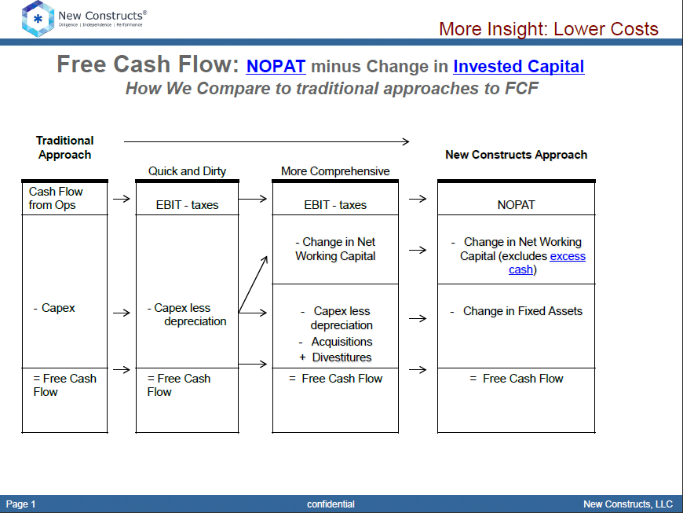 Below, we show how our approach to free cash flow compares with traditional approaches. You can download a copy of this exhibit here.